Alcohol Content: 5.7% Alc. by Vol. Brewed for St. Patrick’s Day, Killarney was created to honor the Irish influence on Montana’s culture. Brewed first in February of 1988, before any other American breweries came out with their versions of an Irish Red style beer. 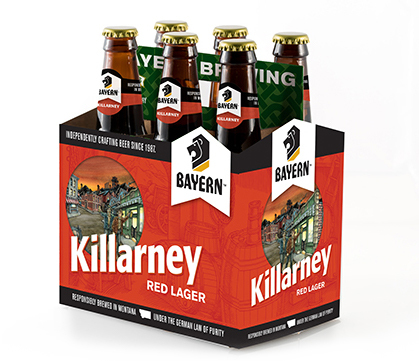 Killarney is Jürgen’s invention of the beer style and one of his favorite Bayern beers. It is brewed with two-row Pilsenser, Caramel, Munich, Wheat and German Dunkel malt. Bayern Killarney has an alcohol content of 5.7% Alc. by Vol. (14.2% Plato o.g.) and is available seasonally on draft and in bottles.